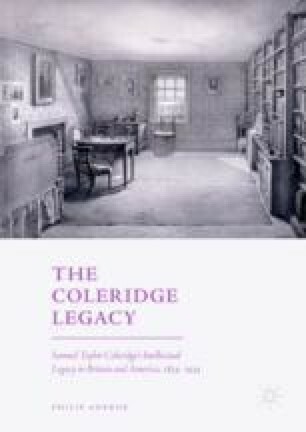 Aherne offers an assessment of the complexities of Coleridge’s legacy and our understanding of it, arguing that there is plenty of contemporary evidence for the significance of his influence, but the evolution of his prose works (and the fact that much of his thought runs through marginalia and his notebooks), the problems that arose in response to the plagiarism accusations and the dominance of his poetic fame have prohibited a comprehensive assessment of it. He discusses the previous critical approaches before explaining his justification for why intellectual history is the best way to assess this topic, introduces the range of thinkers the book will engage with, and describes their relationships to one and other, as well as to Coleridge. Vincent, Andrew, ‘Green, Thomas Hill (1836–1882)’, in Oxford Dictionary of National Biography (Oxford University Press, 2004); online edn. (Jan 2012), http://www.oxforddnb.com/view/article/11404. Accessed 24 May 2018.